An Iraqi doctor who allegedly berated others at Cambridge for not being devout Muslims is the first to be charged in connection with the failed car bombings in London and Glasgow, British police said Friday. Bilal Abdullah, 27, arrested at Glasgow airport after the Jeep Cherokee he was riding in rammed into a terminal building, was charged Friday with conspiring to cause explosions, Scotland Yard said. Seven other suspects remained in custody, including the alleged driver of the Jeep, hospitalized with severe burns. "Other individuals arrested by the police in connection with the bomb attacks remain in custody pending a charging decision," said prosecutor Susan Hemming. Hemming said the charge would relate to attacks in both London and Glasgow. "I have now made the decision that there is sufficient evidence and authorized the charging of Bilal Abdullah with conspiracy to cause explosions following incidents in London and Glasgow on 29 June 2007 and 30 June 2007," she said. Abdullah likely is to appear at City of Westminster Magistrates' Court on Saturday. Witnesses said Abdullah appeared calm and collected as he and an accomplice crashed a Jeep Cherokee into Glasgow's airport and then set it on fire in an attempt to ignite crude bombs. "It was as if they were waiting there to get blown up," said police Sgt. Torquil Campbell, who apprehended Abdullah and the Jeep's driver, Khalid Ahmed, in the packed airport terminal hall. Ahmed is still hospitalized in critical condition, reports CBS News correspondent Richard Roth. It's now known he is not a medical doctor; he has a Ph.D. in engineering, suggesting to some experts that he may have been the bomb-maker. Born in Britain but raised in Iraq, Abdullah was known by others as intense militant Muslim at the University of Cambridge. His status at the university is unclear but records show he graduated in Baghdad in 2004. He also allegedly rented an apartment in Cambridge and frequently visited the city where his grandmother and an uncle lived, according to his friends. Shiraz Maher, himself a former member of a radical Islamic group, said he remembered Abdullah berating a Muslim roommate for not being devout enough, showing him a beheading video and warning that could happen to him. Maher said Abdullah also claimed to have a number of videos of the then-leader of al Qaeda in Iraq, Abu Musab al-Zarqawi, who was killed by a U.S. air strike last year. "He was certainly very angry about what was happening in Iraq. ... He supported the insurgency in Iraq. He actively cheered the deaths of British and American troops in Iraq," Maher told British Broadcasting Corp. television. It was in Cambridge that Abdullah is believed to have come to know suspect Mohammed Asha, when Asha worked at the Addenbrooke's Hospital in Cambridge. Asha was arrested June 30 with his wife, Marwa, on a highway in central England. Details have emerged to show that Abdullah seems to be the key link between the suspects arrested in connection with the failed attacks. He reportedly had links to radical Islamic groups on the MI5 database, British security officials said speaking on condition of anonymity because of the sensitivity of the case. 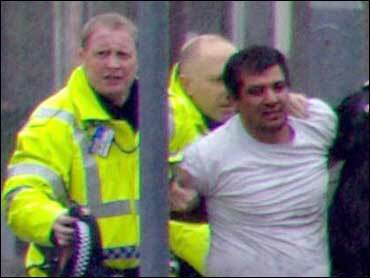 At the time of the attacks, Abdullah was working under supervision at the Royal Alexandra Hospital outside Glasgow. He had been disciplined by his employers for spending too much time on the Internet, according to hospital staff, suggesting the plot may have been planned in cyberspace. Police said they seized several computers from hospitals in Glasgow and other cities. After work, Abdullah would return to a rented house in Glasgow, which a British security official said authorities believed was the site where the plotters made the bombs used in both the London and the airport attacks. Earlier Friday, the FBI confirmed that two suspects in the failed car bombings had contacted a clearinghouse for foreign doctors about working in the United States, and British officials probed links between the attacks and al Qaeda in Iraq. FBI spokeswoman Nancy O'Dowd said Mohammed Asha and another suspect had contacted the Philadelphia-based Educational Commission for Foreign Medical Graduates, as first reported in The Philadelphia Inquirer. She said Asha, a Jordanian of Palestinian heritage, contacted the agency within the last year, but apparently did not take the test for foreign medical school graduates. "He was applying, (but) we don't believe he took the test," she said. O'Dowd could not immediately confirm the name of the second suspect. The FBI this week visited the ECFMG's office in West Philadelphia, O'Dowd said. Obtaining certification from ECFMG is a first step for foreign medical school students seeing a medical residency in the United States. The organization reviews and verifies each applicant's credentials, the newspaper reported. "We verify medical documents, credentials, diplomas and transcripts. The doctors we certify are not guaranteed of anything. It's just another step in the process," Stephen S. Seeling, vice president of operations for the educational commission, told the newspaper. Seeling added that roughly 46,000 people applied to take one of the three exams last year.